New clear and attractive signs are being installed on City parkways and other roads with imagery that connects travelers with the history and public amenities around the iconic parkways. The new signage is the result of collaboration among NYC DOT, NYS DOT, and NYC Parks. Graphic design proposals were received and adapted by the agencies in cooperation with the NYC Public Design Commission. These new facility signs will be installed in the vicinity of the parkway entrances, at gateways, and along the parkways to assist travelers. The series of new parkway signs will be unveiled throughout the year. Commercial vehicles (trucks) are not allowed on New York City parkways. Learn about Parkway Truck Restrictions, Trucks and Commercial Vehicles and the NYC Truck Map. Contact NYC 311 to report an issue with a highway sign. 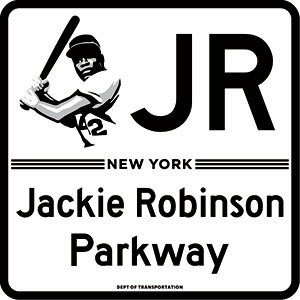 Opened in 1935, the Jackie Robinson Parkway was originally known as the Interboro Parkway, and serves as a 4.95-mile winding road that connects Brooklyn and Queens. In 1997, on the 50th anniversary of Robinson breaking Major League Baseball’s color barrier, New York State officially renamed the road. New signage installed near and along the Jackie Robinson Parkway includes an image of the Brooklyn Dodger legend himself, styled after an iconic 1954 photo. Learn more.